Rituals are very important in Satanism. Any ritual is important no matter how difficult it is or the results it may have. In Satanism, even a single prayer is important. Through this small and simple prayer Satanists can show their respect and gratitude to Satan, can thank him, can ask for guidance, can ask for help, can ask for protection, etc. This is very necessary in the relationship that the Satanist has with Satan. Satanism is practiced. And this practice is not always easy. Thus modern Satanism or LaVeyan Satanism appeared, with the intention of “relieving” a Satanist’s work by leaving out the main character: Satan. In this way the spiritual part was no longer necessary, and so, as people have the tendency of accepting a simple fake easy to understand (rather then a complex truth, difficult to grasp) modern Satanism has been accepted by the big mass of people who were to become, after a nice reading, Satanists. The modern Satanist does not believe in Satan, so as long as you don’t believe in him it is obvious that neither will he bother to show himself to you, even in the case when he is only a part of your imagination. So, therefore, in order to get a ritual to work one must first believe in Satan, in himself, in the ritual and its result. Getting back to the prayer I was talking about. That small prayer is also important for maintaining a relationship with Satan. It is a proof of respect and not only. The ritual must be done daily, thus the adept’s relationship with Satan may evolve. We can compare this relationship with a family. If you don’t stay in touch, the relationship will be lost due to lack of interest. This is very important to know. Many people lose their faith because the ritual didn’t work or the Demon or Satan did not show or respond to their requests. It is just like any other relationship you have with someone. 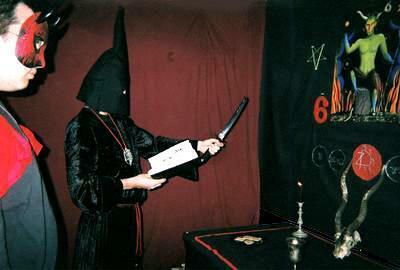 However, in Satanism two of the the most important rituals are the Initiation Ritual and the Dedication Ritual. These two rituals vary from tradition to tradition, but the main ideas of the rites are kept. 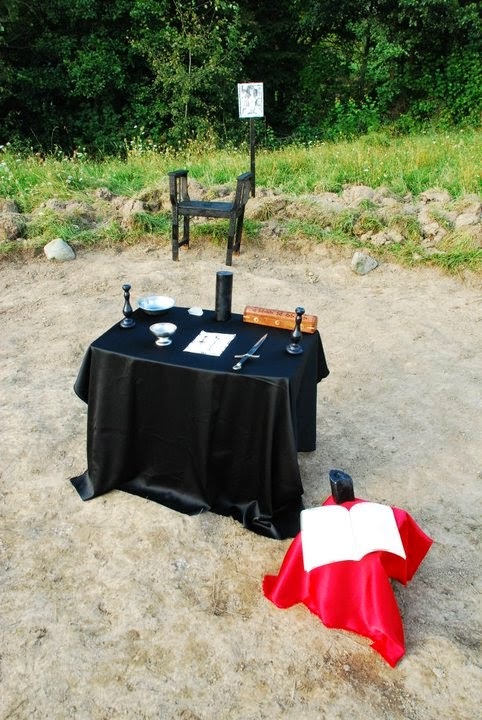 In some cases, the Initiation Ritual represents the introduction of the adept in the Satanic religion and the Dedication Ritual represents the dedication of one’s life to Lucifer’s cause. In other cases, the Initiation Ritual represents the individual’s intention to chose another path. Leaving back the past, the previous religion, the former god and former self. This ritual is pure blasphemy towards the practitioner’s former self and his anterior god. The Initiation Ritual is a portal through which the adept steps towards another path, either symbolic or religious. In Demonolatry, the initiation is a ritual welcoming a new member into the Sect or into Demonolatry, while Baptism represents the beginning of your life as a Demonolater. The Dedication Ritual however, consists, in the Satanist’s case, in his intention to dedicate his soul and life to Satan. It represents the transition to the “new self” and the beginning of your new life as a Satanist. Demonolatry, which we may consider a branch of Satanism, is very similar in its practice. The practice of Demonolatry may be divided in two categories. One is the religious practice and the other is the magical practice. The religious practice is the category of which prayer, ceremonies and celebrations are part of. The religious Demonolaters utilize prayers of sorts for empowerment, devotion, communication with the divine, confession or thanksgiving. As opposed to the Christian form of prayer, Demonolatry prayer is not about asking for mercy, salvation or mundane things. 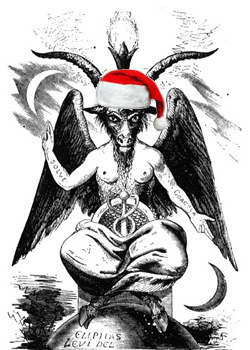 To the Demonolater (as to the Satanist), the divine is not here to grant us things, but to help us become strong and wise enough to get things by ourselves. They ask for the guidance of the divine entities known as Demons. By praying to them and keeping close relationships with these entities Satanists and Demonolaters become more aware of the spiritual world and get to understand it better. The religious rites and celebrations may be those dedicated to the sect Demon, to the Matron/Patron demon or Marriage rites, divorce rites, funeral rites, baptisms, Holidays and others. Others have decided to add to their practice magical operations to aid them into spiritual work. While magick is sometimes incorporated into Demonolatry, it is not necessarily a part of it. Demonolatry is a flexible religion. It is not unusual if a practitioner of Demonolatry decides to add certain practices of different belief systems into their work. Demonolatry is all about experimentation. That means that anything that works for you is good. Magick is merely a tool for those who wish to spice up their lives with more than simple prayers and devotion. As I see it, it is for those who have exceeded the period of calling Demons for help. 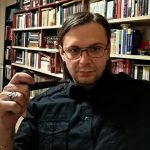 I have decided not to talk much of Demonolatry practice in this article, but there are few points I would like to make here before I close this subject. In Demonic Magick it is common that a circle is to be constructed in the ritual space. Unlike the traditional ceremonial magick rituals, in which circles are made for protection, the Demonolatry circle is made to contain and balance the energies in the rituals. There are also rites in which triangles are constructed where all the nine divinities are called upon (three to each point). These rites exist to create a more vibrant flow of energy. Black, red, purple, grey or white robe, depending on the ritual. If a robe is not accessible, dress in black clothes, comfortable enough, which will be worn only at rituals. Or, if comfortable, you can renounce clothing. A dagger, knife and even a sword for invocations and to trace demonic sigils in the air with the blade and call at the cardinal points. A steel or silver cup/chalice. For water, wine or any other liquids to drink. b) Burning different objects belonging to other persons, either enemies or friends, for rituals for revenge, love, health etc. * I believe a crystal glass is ok too, if you can’t find a silver or steel bowl. Or any material resistant to fire. A bell. It is used to purify the air and to signal the beginning and the end of the ritual. Candle holders. To protect the altar from burning and from wax. Paper and pen. To write down requests which will later be burnt in the candle fire or just papers containing rituals to be read from while doing the ritual. Private journal/grimoire (magick book). They are used to write down rituals, the spirits to invoke or have invoked, all the information about the demon that is going to be invoked, to write down satanic poetry and prayers and to write all experiences related to Satanism. * The tools must be cleansed at least once a year. For this it is recommended that you use a knife and warm water to remove melted wax. To brush use dry earth, fire to sterilize and water to rinse the tools. Then, lay them at air to dry. 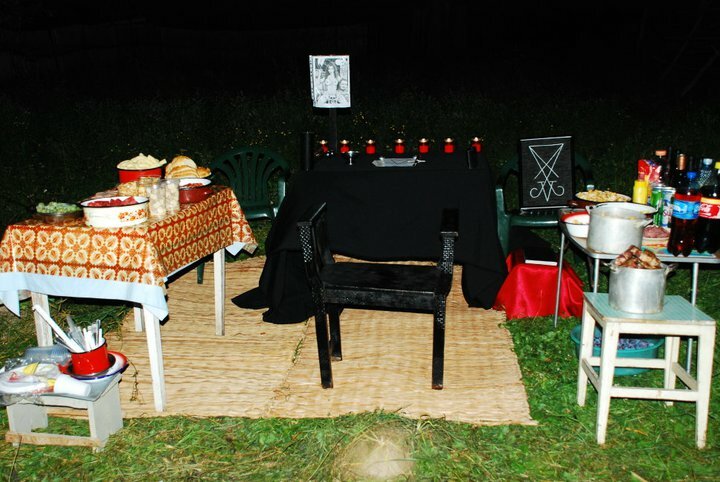 Satanists need a table to use as an altar. And only altar! They don’t eat on it, don’t put other things on it rather then the tools for rituals and don’t allow other people to rummage at it. 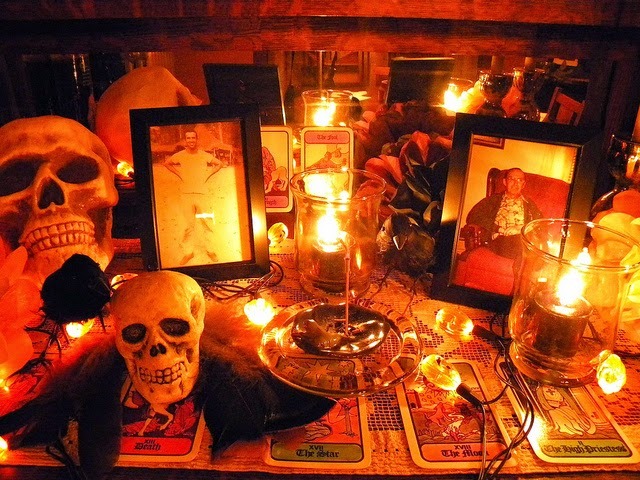 The altar is very important because it represents a connection between the practitioner and Satan (or the Demon). It is the first thing the Satanist needs to maintain. Black cloth is needed to cover the altar. The black cloth will be washed by hand, not in the washing machine together with dirty clothes. It is preferable to decorate both the altar and the walls with various satanic symbols. Traditionally, the front wall must have a painting/drawing, a representation of Satan or Baphomet, to serve as a focal point in rituals. On the altar (or under… or in, if there’s a drawer. in case the altar is not big enough to have all tools on it, will put on only the ones used at the moment) will be present all the tools listed above. The way tools are placed on the altar depends on the practitioner’s creativity. However, to arrange the tools correctly on the altar it is needed to integrate in the space so that it won’t be too crowded and the tools are not going to be placed dissonant. 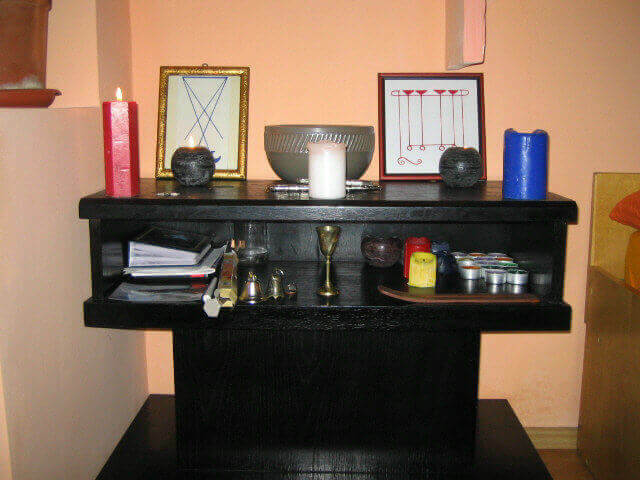 If there’s a big altar, it is recommended to place two black candles on each side (the candles should be as big as possible. the light during a ritual must come from these two candles not from a bulb, lamp or other electric sources). In the middle of the altar there must be either a candle which the Satanist is using at that time (for example, the candle for Satan or for the Demon invoked) or a purple or black candle. This candle is placed in center for concentration or burning papers and other materials. In front of this candle it may be placed the cup or the bowl in which they are going to leave the burning materials. On the left side there must either be the knife, or if there’s a support for the knife place it there, and instead of the knife may be put the journal. And on the right side of the altar will placed the papers and the pen. * Many Satanists can’t have an altar in the house because they live with persons who have another religion and do not agree with Satanism and their beliefs. Hence, I suggest a small portable altar. The altar must be treated with respect. After you used the altar you will clean it, dust it, and place it in a clean blanket, and afterwards you may hide it somewhere no one will ever find. As I said, rituals are very important for a Satanist. They represent the practice of his faith. A ritual will work guaranteed as long as it is done from the heart. To make a ritual the practitioner must believe in himself and in its result. A ritual is done with maximum seriousness, with no restraint. If, because of fear, emotions, uncertainty or any other factor the practitioner makes a mistake and overthrows the entire ritual, there is no reason to panic. He may concentrate and continue the ritual. In time these factors both internal and external will no longer be a problem. All is learned in time. But for this the practitioner must be certain and unhesitating in what he does. * Satan guides/helps/teaches/etc each Satanist the way he chooses to. So, the experiences may differ from other Satanist’s experiences. The following information is inspired from the book Complete Book Of Demonolatry by S.Connolly. Ritual consists of three universal parts true to all schools of occult thought. The Beginning/Opening, The Middle, and The End/Closing. The Beginning – The invocation/invitation of the entity (entities) you are calling forth to join you in the ritual. In Demonolatry, an elemental circle is invoked with the Demons Belial for North/Earth, Lucifer for East/Air, Flereous for South/Fire and Leviathan for West/Water. Satan can also be invited as the fifth element, or the wellspring from which all energy flows. 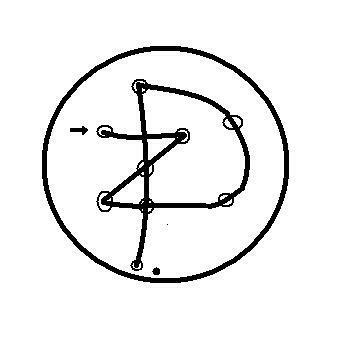 Also in demonolatry, people choose to use enns, a special type of demonic invocation in an unknown language. Remember that in Demonolatry evocation suggests calling a Demon to physical manifestation against his will while invocation is a prayer asking the Demon to be present or to bless the rite. A Satanist/Demonolator uses invocation, out of respect for the demons, and never evocation. The End – The ending of the ritual is when your work is done and you get to dismiss/say good-bye to the Demons and thank them for their presence. Basically you are telling your assembled guests (your personal pantheon) that you appreciate them coming over to help, and you are seeing them to the door like you might a houseguest. The candles are extinguished. Clean up and so on. There would also be the ritual follow-up. After doing a ritual or a working of magick, you can’t just sit idly by and wait for a raise or new job to fall in your lap. You should actively participate in magick and ritual until the result is done. That participation means getting to work on time and showing your boss you are competent and deserving of a raise. It means you have to go out and fill out applications.